We believe that everyone deserves to live an independent life. Through our accessories and haptic language, we empower blind and visually impaired users to safely and intuitively navigate to any destination. We are a group of passionate designers and engineers focused on building the next generation of wearable devices that improve living in urban environments. Keith is a Fashion and Industrial Designer with a background in Mechanical Engineering. He has created different types of wearable devices, including a Kung-Fu downloading bodysuit. Keith is a natural speaker with a glow of positive energy. Daniel’s background is in fashion and textile R&D at Parsons School of Design. Fabric is our second skin is her motto. She engages in a tangible vision for pushing fashion of the future. Daniel loves to play tennis, make wearables and ride the vespa! With a background in behavioral sciences and intense passion with human observation, Layah brings her skills to creating research driven, universally accessible design. Layah is also the team’s therapist and a darn good one. Quinn is a talented coder with understanding of the greater cause. She is dedicated to make haptic design more intuitive, striving forward in something very new. Quinn is fearless and will make the future a better place for us all. Celine is talented and ambitious to learn. Her interest in 3D knitting technology and fashion made her special from the rest. She will grow to be a valuable member to our team. Kevin is a born entrepreneur with heavy focus in Product Design and Sustainability. Combined with passion for human-centric innovation and background in haptics. He has a keen sense for new growth in business, the market and technology. Kevin expands fearlessly. Ben is cool and he bikes professionally. He can make PCBs in his sleep and win a race while taking a nap. Truth about Ben is that he never gets angry, he only gets calmer. Composed Engineer and everyones favorite engine. Fritz is a pure efficient German machine. He can make things. Attentive to detail and precision is the key to a great engineer, which runs in his blood. Fritz is an iron man, literally, he works out the mind and the body with rigourous routines. Owen is the best there is when it comes to anything technology. He left MIT to pursue a better future for his life. Understanding machines like a well trained AI, Owen may be an AI himself… Or a pure human genius. 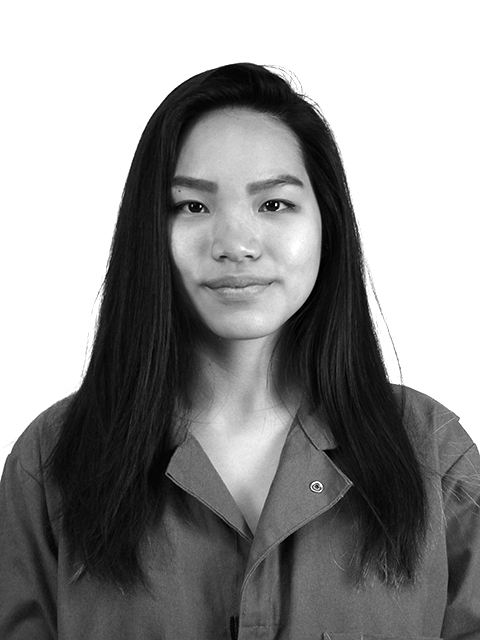 Sam is focused on Mechanical engineering and product design. He strives to innovate for the improvement of human experience and sustainability. He is a born hockey player and a young entrepreneur with bright future ahead. Yang is a Mechanical Engineer turned Industrial Designer. Having designed public sculpture, streetlights, eyewear, jewelry, and more - his expertise is in bringing product from prototype to manufacturing. Yang is the smart skeptic that keeps the crazies together. Paige is strong, loyal and clever. Her design skills are broad yet detailed to positive self interest and values. Paige is a one of a kind fighter, an actual martial artist. She’ll take you down! Kendall develops unique brand voices through human-centered design. Her MFA in Design for Social Innovation from the School of Visual Arts allows her to create with empathy. She's also a huge music nerd. Frances is a human centric UX designer with a passion for impactful, inclusive experiences through wearable technology. Frances has the chillest vibe on the team, keeping it real and keeping it fresh.